With mag+, you get your own completely branded app for the mobile devices of your choice: iPad, iPhone, Android tablet and phone, and Kindle Fire. 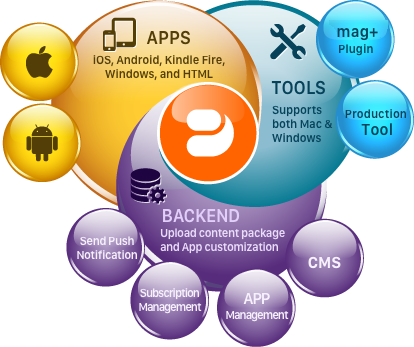 That app is the hub through which you serve all your content to your users. Build your app in minutes, not months, with mag+’s online app builder. Just upload a few images, pick your features, and click “Build.” In minutes, you can download a fully functional app to submit to the market of your choice or to distribute internally. mag+ apps are built on a solid common platform, but your app is entirely yours: your colors, your icons, your brand. Plus, mag+ offers you deep control over the features and options you want your app to have. Another optional space in your app is the Live window, where you can serve any website. You can even modify the URL without submitting an app update. With mag+, you always have total control over the distribution of your issues: offer a bonus issue for subscribers or hold back an issue only for purchase. Offer a free issue with the app download or hide all issues behind a log-in. mag+ apps can be distributed internally to your employees and bypass the public marketplaces using Apple’s Enterprise license. You can use any MDM or MAM solution you like to distribute the app. Offer your app through any of the major marketplaces: Apple iTunes, Google Play, or Amazon App Store. The app can be free or paid – it’s up to you! The documents you serve to your app can be hosted with mag+ using our Amazon S3 account with dynamic URLs, or you can keep the content on your own servers or those of the host of your choice. Gate your content behind a sign-in window in the app. mag+’s simple Access Control API ties in to your user database, where you have complete control over the issues any given user should see. You can even remotely expire or delete issues from a device.